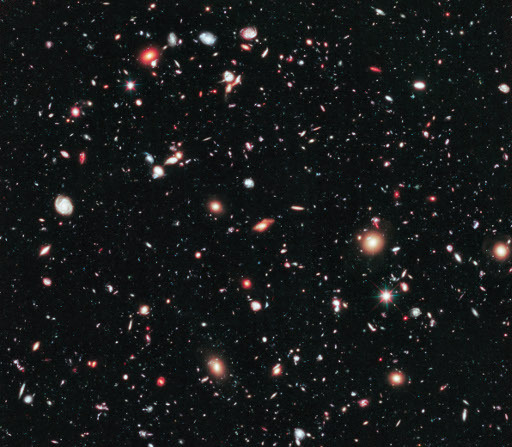 This image is the Hubble eXtreme Deep Field (XDF). It was created by combining many images taken between 2002 and 2012 by the Hubble Space Telescope. The total exposure time was 22.5 days (almost 2 million seconds), and the image contains 7120 galaxies (not stars, galaxies). Figure 1. The Hubble eXtreme Deep Field (XDF). The cosmological principle that states that the universe is uniform when viewed at a large enough scale. In other words, this image is not special in the sense that any other direction should produce a very comparable image. The size of the image (i.e., the part of the sky that is imaged) is 2.3 by 2 arcminutes. An arcminute is one-sixtieth of a degree. Say the image is about 10 cm (4 in) high on your screen. Since there are 21600 arcminutes (360 × 60) in a full circle, and the image is 2 arcminutes high, this implies that you’ll need 10800 of those images for a full circle. At 10 cm per image, this would produce a circle with a circumference of 1080 m. Dividing by π results in a diameter of about 340 m (375 yards). Now picture yourself in the middle of a ball with a diameter of 340 m. Close your eyes if it helps. At 170 m away in all directions (including up and down), imagine a tiling of images just like this one, with thousands of galaxies in each patch of 10 × 10 cm. That’s how large the universe is! Pretty cool, huh? For more information on the XDF, go to the XDF Project website.